Officer Hurt In Crash Now Out Of The Hospital | Schuler, Halvorson, Weisser, Zoeller & Overbeck P.A. A Boynton police officer was struck by a vehicle while responding to a crash. The officer injured in the crash is out of the hospital, Boynton Beach police said. The police department identified the officer as Brittany Suzanne Jones. She is 28 and joined the department in January 2015. “She is out of the hospital but has a long road to recovery. She thanks everyone in the department and public for their support and well wishes,” the agency said in a statement. 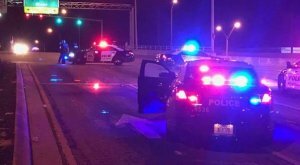 The officer’s 2014 Ford Taurus was struck as she traveled north on Federal Highway approaching Ocean Avenue. Police said a southbound 2014 Chevrolet Equinox turned left in front of the patrol vehicle, striking it in the front driver’s side. The officer swerved to the right, then struck a traffic light post at the northeast corner of the intersection. The report said Jones suffered head and leg injuries. It said Boynton Beach Fire-Rescue took her to a unnamed hospital. The other driver, a 42-year old man of Greenacres, was declared at fault and was issued a citation for failing to yield, the report said. The agency withheld the officer’s name after the crash, saying it would release it after its initial report was complete.